The enclosed is an image that will be the subject of the Bronx Documentary Center’s upcoming exhibition Altered Images: 150 Years of Posed and Manipulated Documentary Photography as well as other related programming. The BDC makes no representations nor extends any rights as to use of this image by another party. Representation: The photograph, taken in the earliest days of the Iraq invasion, shows a British soldier warning a group of Iraqi civilians to take cover from nearby fire. 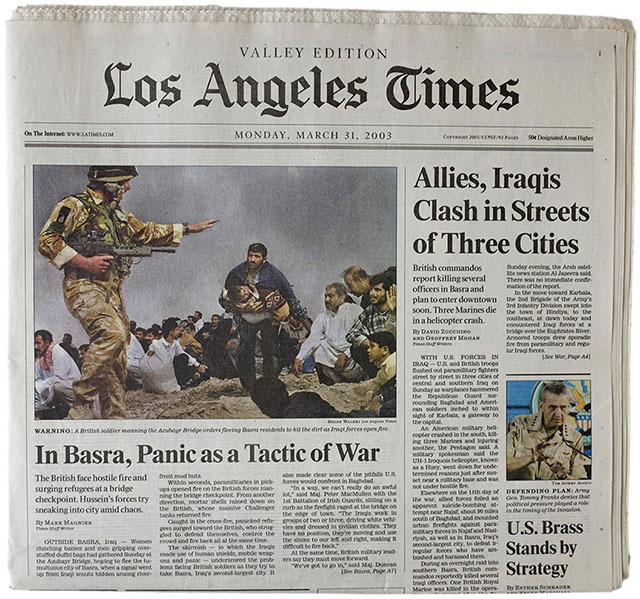 First published on the cover page of the Los Angeles Times, the image also ran in the Chicago Tribune and the Hartford Courant. Reality: The photo is a composite of two images taken seconds apart. After the Hartford Courant published the image, a Courant employee noticed a duplication of civilians in the background. The Los Angeles Times confronted Walski, who confessed to having digitally merged the two photographs to improve the composition.